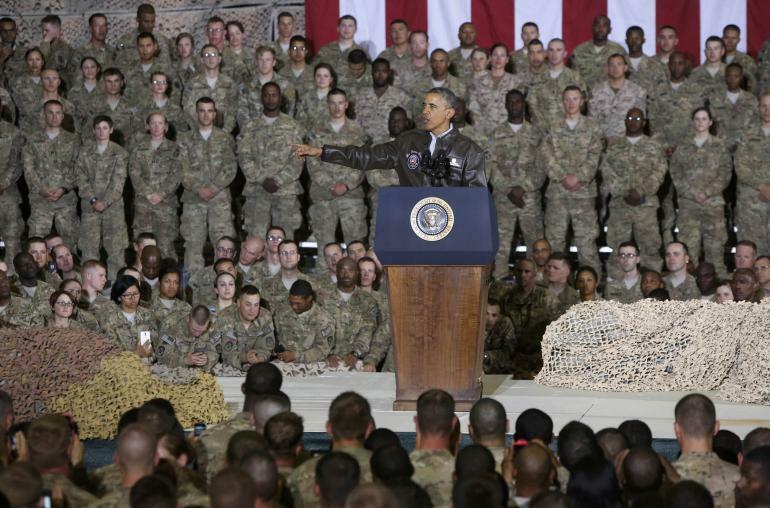 JNN 29 May 2014 Kabul : US President Barack Obama announced on Tuesday his intention to leave 9,800 troops in Afghanistan after the end of combat operations this year. Speaking in the White House Rose Garden, President Obama also stated that all American troops would be pulled out of Afghanistan by the end of the his second term in 2016, except for those required to maintain a normal embassy presence. Beginning in 2015, the president said, “Afghans will be fully responsible for securing their country,”with remaining US forces filling an “advisory role.” American troops would still be open to training local forces and supporting counter-terrorism operations against the remnants of Al-Qaeda, but they would no longer be patrolling cities and streets as they do currently. The drawdown blueprint is contingent on Afghanistan’s government signing a stalled bilateral security agreement. While current Afghan President Hamid Karzai has refused to sign the accord, US officials say they’re confident that either of the candidates running to replace him will finalize the deal. In fact, both candidates who are on the ballot in next month’s runoff — former Foreign Minister Abdullah Abdullah and ex-Finance Minister Ashraf Ghani Ahmadzai — welcomed Obama’s announcement Tuesday. There are approximately 32,000 American troops currently in Afghanistan. That contingent would be cut down to 9,800 in 2015, with troops stationed across the country. In 2016, that force will be cut in half and consolidated in Kabul and Bagram Air Base as the US prepares a normal security contingent for the future, similar to the country’s embassy presence in Iraq. Obama acknowledged that the US presence in Afghanistan has been longer than many Americans expected, but said, “we have struck significant blows against Al-Qaeda’s leadership,” eliminated Osama bin Laden, and provided Afghans an opportunity to build their own democracy. As noted by president, the plan hinges on both the US and Afghanistan coming to a mutual bilateral security agreement – something that has eluded American officials thus far. Afghan President Hamid Karzai has refused to sign such an agreement, but Obama said he is “hopeful” that whomever wins the country’s upcoming presidential election will agree to the proposal. Still, Obama cautioned that while the US will end its military operation in Afghanistan, the country’s struggles would likely continue. “Afghanistan will not be a perfect place, and it is not America’s responsibility to make it one,” he said, adding that the future is in the hands of the country’s own people. The announcement came just one day after Obama addressed troops at Bagram Air Base, arriving on a surprise visit from Washington. Obama did not meet with Karzai while in Afghanistan; Karzai declined an invitation to meet Obama at the base, and the US president then rejected an opportunity to meet at Karzai’s palace in Kabul. Despite tension between the two administrations, Obama phoned Karzai ahead of his announcement in order to detail his proposal. The president has also reportedly discussed his plans with German Chancellor Angela Merkel, British Prime Minister David Cameron, and Italian Prime Minister Matteo Renzi. US forces had already been on track to stop combat operations in Afghanistan by the end of 2014, more than 13 years after the American-led invasion. But Obama wants to keep some troops there to train Afghan security forces, launch counterterrorism missions and protect progress made in a war that has left at least 2,181 Americans dead and thousands more wounded. This entry was posted in Asia Pacific, United States and tagged Abdullah Abdullah, afghan president hamid karzai, afghanistan, Ashraf Ghani, Barack Obama, Hamid Karzai, obama, pakistan, President Obama, us, US Troops. Bookmark the permalink.